As a freelance writer, the importance of a great portfolio can’t be overstated. It’s one of the most important things you’ll ever design, and it portrays your professional image. Furthermore, it may stand between you and your next job. 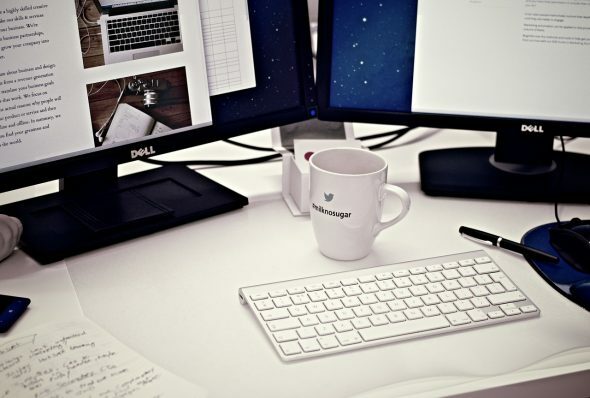 Now, you’re a writer, not a designer, so you might make a few mistakes here and there. To minimize issues, read on for a list of common portfolio mistakes and how to avoid them. A good profile will include an “About Me” section that tells about what you do. Oftentimes, you’ll use a witty tagline that’s easy to remember and clearly outlines your mission statement or value. Most importantly, there should be adequate contact information, links to your social profiles, and links to your blog or website so clients can get to know you online. If you’re seeking a professional position, you should post-professional work. Post your most current and strongest examples, and avoid using school projects, if possible. If you don’t have any other work to show, school projects are okay, but replace them as soon as you have something better. 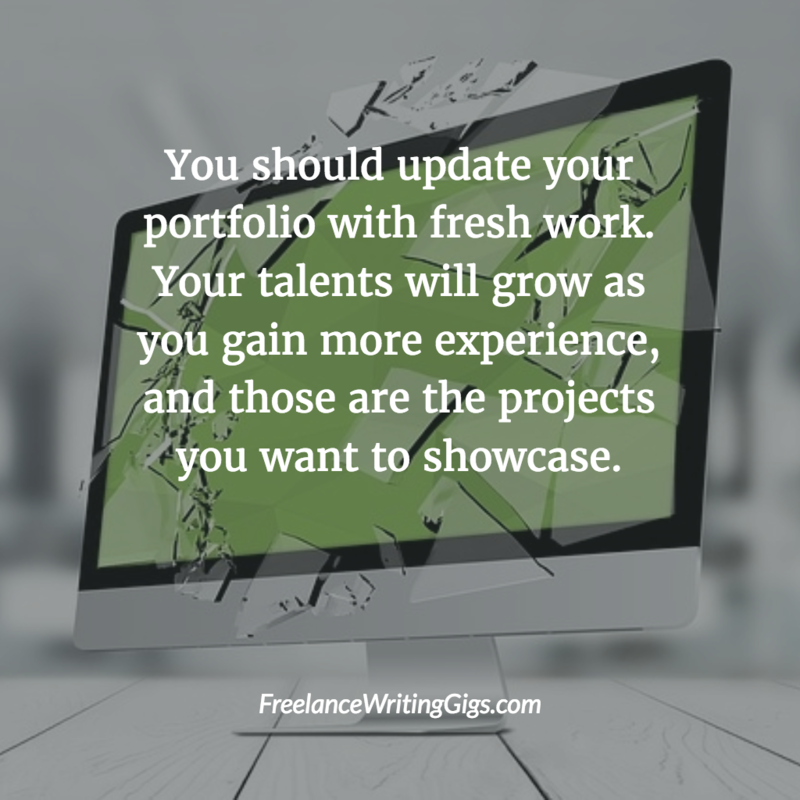 Additionally, you should update your portfolio with fresh work. Your talents will grow as you gain more experience, and those are the projects you want to showcase. Use a website builder like Wix that offers the flexibility to update your portfolio in the future. It’s great to be humble among your friends, but when you’re bidding for the job, you need to show off your best attributes. If you’re confident in a project, clients will have confidence in you. While you point out your strong traits, avoid arrogance. Bragging isn’t an attractive quality, but you can let the client know you’re in charge of the situation. It’s true that your samples will include plenty of text, but they won’t always speak for themselves. For that reason, you should provide a little context to your work. Explain why you did a certain piece and what you like best about it. You only need a few sentences that will show the viewer the diversity of your talents. You could also point out the satisfaction of the client, elements of the project that aren’t shown, or the timeline for the project. Just remember to keep it brief, yet packed with important information. On the flipside, you never want to spend too much time explaining a project and not enough time showing it. Some portfolio owners have even gone so far as to talk about what they’ve done without showing an example of it. This is a portfolio, not a resume. Clients have probably already read all about what you can do, and now they want to see it. Make your examples readily available. It’s surprisingly common to see someone’s age posted on their portfolio, even though it’s completely irrelevant to the job at hand. Doing so is a rookie move. It makes you look younger and more inexperienced than you really are. It’s not important and it could lose you the client. Just stick to the necessities and cut the fluff like your age, relationship status, hometown, and other personal details. If you post your blog or website on your portfolio, know that potential hires will probably click on it. If they find that your blog has been collecting cobwebs instead of being regularly updated, that can make a bad impression. As a general rule of thumb, do it well or don’t do it at all. A blog linked to your portfolio should be regularly updated, well-designed, and in line with your business goals so that clients get the best impression possible. Some portfolio designers recommend comparing your strengths and your weaknesses when showcasing your skill set. There may be some advantage to making your strongest points clear, but unfortunately, the weaknesses you compare them to will likely stand out. 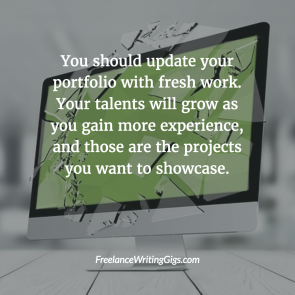 You probably have a few talents that you do particularly well, and those should be addressed within your portfolio. Otherwise, maintain a “fake it until you make it” attitude. If you’re incompetent in something, you can address that in the interview, not on your portfolio. Don’t forget that your portfolio is often the first impression clients will have of you. By avoiding these mistakes, you can rock that first impression every time. Read more about online portfolios. Editor of Splashpress Media, Noemi used to be an English teacher before going freelance full-time. She has a penchant for words and likes to play around with them - the result of a lifetime of burying her nose in books. Having been bitten by the travel bug, she aims to discover more languages & places in the near future as she continues to do what she loves most - writing.